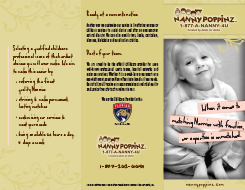 If you are interested in a successful career as a Nanny while making a difference in the lives of San Antonio area families, then Nanny Poppinz has the job for you! Since 1992, Nanny Poppinz has helped thousands of Nannies find jobs with families who appreciate true quality childcare. At Nanny Poppinz, we only refer the highest quality Nannies to families. That's why we personally interview our Nannies before sending them to meet a family. As a Nanny Poppinz Nanny, you will have relevant childcare experience, be legal to work and will have passed a detailed background and computer check. We also want to make sure that you have the necessary skills in the event of a childcare emergency. That is why we require each Nanny to be CPR, First Aid and AED trained. But at Nanny Poppinz, we don't pass the cost of training on to you. One Saturday a month, we offer free classes taught by a licensed, registered provider. Nanny Poppinz cares about our Nannies and wants to help find a job that is perfectly suited for you. Let Nanny Poppinz help you find your perfect family match today! To get started, click on the 'Nannies Click Here' link to complete your application or call DeeDee at 210-775-2185. Additional Requirements:: Will need a nanny for all day on 4.19.19 & 4.26.19. "I’m looking for on-call sick child services and possibly after school care a couple times a week." Pet Description: Old and friendly. One of them barks when someone is at the door but he’s very calm otherwise. Additional Requirements:: Must be able to start as soon as possible until a permanent nanny is hired. Pet Description: Daisy is a super easy dog and can spend most days outside in the backyard unless the weather is too wet or hot. Cleaning Duties Details: Encourage children to clean up after themselves, please clean counters after eating or spills. Additional Duties: We are looking for an afterschool nanny 3-7pm, Monday-Thursday to care for our 7 year old twins. Not sure if kids will ride bus home or need to be picked up from elementary school. We would like for our nanny to do homework with kids, play, read, remind them to clean up and prepare them dinner. Hoping our nanny will eat with them too. She would guide their activities and get them ready for evening/bath routine. They are independent with showers/teeth, etc., but just need help drying hair sometimes. Light house clean up around kids activities, eating, play. We will pay $18/hour. We will not ask nanny to work any major holidays as we are off. This includes 1/1, MLK, Memorial Day, Fourth of July, Labor Day, Thanksgiving Th/F or Christmas Day. Additional Duties: Meals cooked for baby!! Breakfast and lunch! Pet Description: friendly dog who lives inside. Cleaning Duties Details: toilet/bathroom, dusting, vacuum, kitchen. Additional Duties: Homeschooling teacher and caregiver for child. Additional Requirements:: No - we are looking for weekly part time help and an occassional weekend day sit or date night sit. Cleaning Duties Details: Anything child related - picking up Toys, cleaning up after the child. Additional Duties: Need Nanny from around 3:00 PM to around 9:00 PM weekdays Monday through Friday. Will need school pickups and transportation to and from after school activities. Additional Requirements:: Hi there, I travel to S.a. for work frequently and would like to bring my 5 year old son with me for spring break (last week of march). I'm looking for some care for a couple of days that week as i have work commitments (likely weds and saturday). Cleaning Duties Details: cleaning of baby items and room. Living Area: This would not be required, but for late nights or weekend trips while parents are away, we have a guest room and bathroom that is on the other side of the house from the master. Additional Duties: I am looking for a flexible nanny to be available during the week from 7:30-6 and occasional date nights and weekend days. Living Area: They can have free roam of the house. OtherNeeds Emery is smart, likes structure, a natural leader, likes responsibility, and can be strong willed at times. She enjoys playing inside and outside. Loves to read, color/draw, teach, play with baby dolls and pretend. OtherNeeds Conner is a sweet boy. He is 3 so he has tantrums and meltdowns, but most of the time he is happy. He usually follows his sister around and does what she says, but sometimes he rebels when he's tired of following her. He loves to be outside. He loves driving trucks and playing with trucks. Additional Requirements:: I am starting a new job as a dance instructor that will require me to work in the evening two nights per week. This is new and my schedule is subject to change but will be limited to 2 nights per week of work and occasional saturdays. My Husband owns a business and has limited availability but he will try to be home to take care of the kids as much as possible which would alleviate the nanny of her duties for that specific day. Housekeeping Frequency: Hopefully, every 2 weeks. I am still searching for a good one. Trying a new one out tomorrow. Cleaning Duties Details: Cleaning dishes used from cooking and cleaning up after kids. Living Area: There is no separate living area for the nanny. There is no separate bedroom. The nanny should be where ever the kids are. Additional Duties: Will usually need the nanny 2 days during the work week. There may be occasional times when I may need her on a Saturday. I will need her to pick kids ups from school, help with homework, cook or heat up a meal, tend to pets (2 dogs and 1 cat) in the home, bath, and put kids to bed IF my husband is not able to do it. His work schedule is unpredictable and he may be home earlier on certain days. Additional Requirements:: I have 2 kids, ages 9 and 10. I work until 6:30-8pm depending on my clients. I would need someone to be able to pick up my son from school at 3 and my daughter at 3:45 on Monday, Wednesday and Thursday, on Tuesday and Friday they would ride the bus to our apartment and be here at 3:45 and work weekends. Additional Requirements:: Must have reliable transportation if live out. Must be a nonsmoker. No guests allowed in home at anytime. Housekeeping Frequency: We have a regular housekeeper who comes in once a week. Pet Description: One dog, 18 pounds. If you're a dog person and want to take him out, that would be great. If not, we will take him out ourselves. Cleaning Duties Details: Light cleaning, really just baby stuff. Washing baby bottles/dishware/clothes and putting them away. Cleaning toys and putting them away. These are secondary as needed tasks to be done when time is available. Living Area: Full furnished, flat screen TV, wifi. Shared use of kitchen, living room, media den (150" projection tv), swimming pool, deck...we have an incredible view. Cleaning Duties Details: Clean up after making meals. OtherNeeds My colleague is travelling to San Antonio for a business trip this coming Wednesday. For personal reasons he is bringing his 12 year old daughter with him and therefore we are trying to find someone that can supervise her for half a day or a full day - maybe a trip to the zoo etc. She's 12 years old so we are hoping to organise someone that can show her around a bit and do something more interesting than sitting in a hotel. Cleaning Duties Details: Maybe dishes and laundry. Who is responsible for the pets: Adults. Additional Requirements:: I’m new to this not to sure what to expect, I am a single mother with a year old. I work Monday through Sunday starting at 3pm to 12am or 3am my hours are in a mix so some times I may work a 8 to ten or 11 hr shift at times we are off weekends or work just Saturday depending on production I am off holidays, Love to know more about your program, I’m in a struggle to keeping a sitter.. thank you for your time. Additional Requirements:: We are a military family, so we ask you come into this with and open mind and be flexible. Additional Duties: Shift workers, nights and weekends rotating. 12 hour shifts 3 days a week only! Additional Duties: Monthly schedules defer due to job schedule changes for days & AM/PM.